I’m REALLY excited for this. Barker’s The Hellbound Heart remains among my favorite works of fiction, ever, and hearing it performed will be pretty damn cool. Pun, as always, intended. 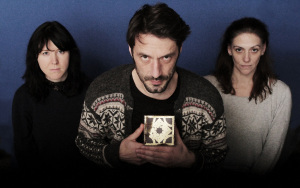 Bafflegab have announced that Alice Lowe, Tom Meeten and Neve McIntosh will be starring in their new audio based on Clive Barker’s The Hellbound Heart. Lowe (Prevenge, Sightseers) will play Kirsty with Meeten (The Ghoul) as Frank/Rory, and McIntosh (Doctor Who) as Julia. The play also features a cameo by Nicholas Vince, aka the Chatterer in Hellraiser.